After last issue’s nightmare, Rom and his newfound friends, Brandy and Steve, finally make it back to Steve’s place for some much needed relaxation. Their flight from the Dire Wraiths and the haunted house have left them taxed mentally and physically. Time ticks on though and Brandy has to get to work. No rest for the weary it seems. Rom has entered his rest mode after recharging but unbeknownst to him, the Hellhounds are still after him and he now must battle for his life. 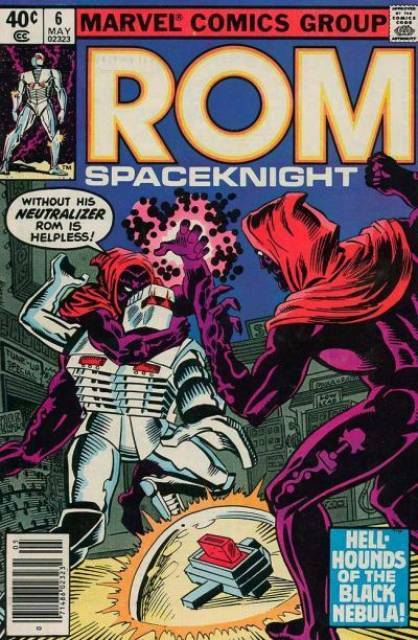 A really great chapter in Rom’s ongoing saga presents itself from writer Bill Mantlo and artist Sal Buscema. Mantlo gives our hero a very brief respite and then throws him back into the action as if he were a rag doll and he does so against some great villains and some true monsters in the form of the Hellhounds. Project Safeguard is in a little turmoil due to their dealings with Rom and their leader is not in a forgiving mood. There is no forgiveness in the ranks of the Dire Wraiths and it is interesting to see that there is little trust on their side even though they all want the same thing. Mantlo even throws in a little joke about the Safeguard building being dreamed up by a ‘fantastical writer.’ Superb as always.